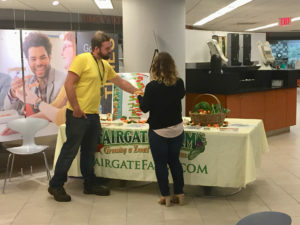 Fairgate Farm participated in the Synchrony Financial’s Hispanic Heritage Celebration on October 10, 2017, in Stamford, CT. The event featured DJ, live entertainment, and a dance demo and lessons by Dance With Me (owned by Maks & Val Chmerkovskiy and Tony Dovolani of Dancing with the Stars fame) as organized by event planner Barbara Occhino. The company strives to support cultural diversity and this annual event features music and dishes from Latin America. 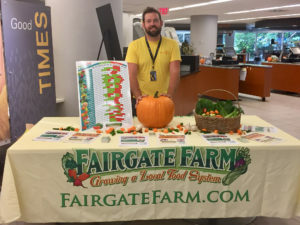 The Fairgate Farm table supplied organic produce to compliment the theme, like free samples of jalapeno peppers, tomatillos, garlic cloves, along with fresh kale and other garden treats.